Six months ago, on a sunny day in March, I planted three rows of carrots in the garden. Danvers, Chanteray Royals and Thumbelina Carrots (all sourced here). for CARROT CAKE! The Grit's, no less. Yesterday, Mama and I picked, washed, peeled, grated. Measured, poured, stirred and baked. And - of course - ate our delicious orange cake. 6 beaten eggs, at room temp. 1. Preheat oven to 350 degrees. Grease 3 9-inch round cake pans, dust with flour, and line bottom with parchment or wax paper. 2. Sift together flour, baking powder, baking soda, cinnamon, salt, nutmeg, and clove in a large bowl. Thoroughly mix eggs, sugar, and vegetable oil in larger bowl, then stir together with flour mixture until fully combined. Add carrots, walnuts, and cranberries and stir together until fully combined. Divide batter evenly into prepared pans. 3. Bake 30-35 minutes or until a knife inserted in the center of the layers comes out clean. Remove from oven, cool 15-20 minutes on a wire rack, then remove from pans. 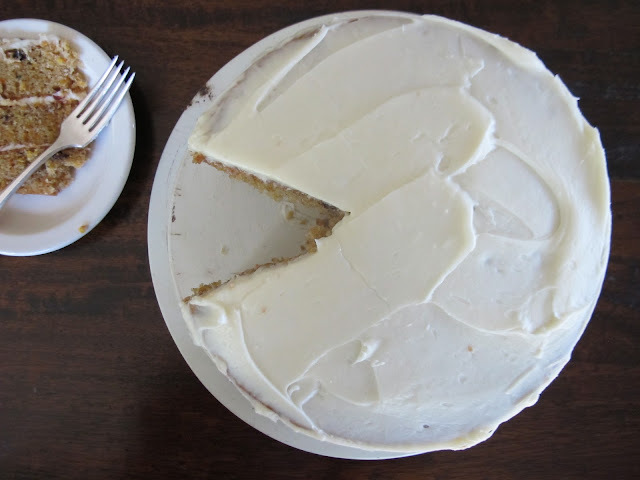 Allow layers to cool completely before icing. 4. Beat together cream cheese, butter and vanilla until creamy. Slowly add confectioner's sugar until well combined, then ice cake. 5. After icing, sprinkle the top lightly with crushed walnuts. P.S. The Grit Cookbook has lots of other delicious things besides cake - check it out if you're interested.